Amazon is in the process of discontinuing the entry level Kindle. This is the e-reader is primarily aimed at new users and normally costs $79. Amazon has removed it from the Kindle Family page and the only readers they are marketing is the Paperwhite, Voyage and Oasis. The entry level Kindle came out in 2014 and has an older E Ink Pearl display, which is really outdated e-paper technology. It has abysmal refresh issues when it comes to page turns and interacting with all of the menus and navigation bar. The Basic Kindle is the oldest digital reader that Amazon has consistently sold for the past four years, and has sold well. 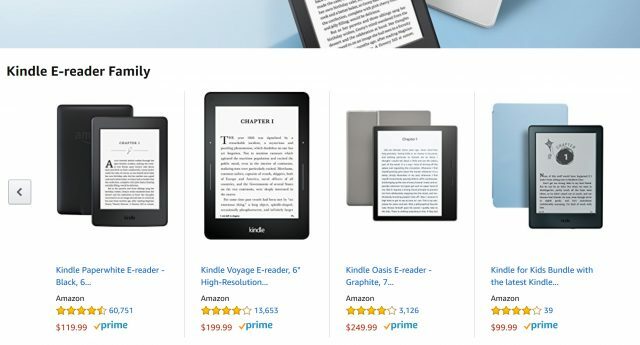 Amazon is likely going to refresh the entry level Kindle and the Paperwhite in the coming weeks. The entry level Kindle will have an E-Ink Carta HD display, which will have the same resolution and PPI as the Kindle Paperwhite. Speaking of the Paperwhite, this device is rumored to have a new color temperature lightning system that is similar to the Nook Glowlight 3 and the Kobo Clara HD. The Paperwhite will also have Bluetooth capability which will allow you to plug in wireless headphones or a speaker to listen to audiobooks from Audible.